Hello ... Hello ... my old friends ... It's great to see you once again! Where I do I start with this review? I say this because listening to this new all-encompassing compilation a couple of times has reminded me [a] just how much of a musical song writing legacy Roy Wood has and [b] how much of his output I absolutely love! Doubtless you are aware that Roy is the co-founder of The Move and ELO as well as being the founder of Wizzard and not a few other bands too! 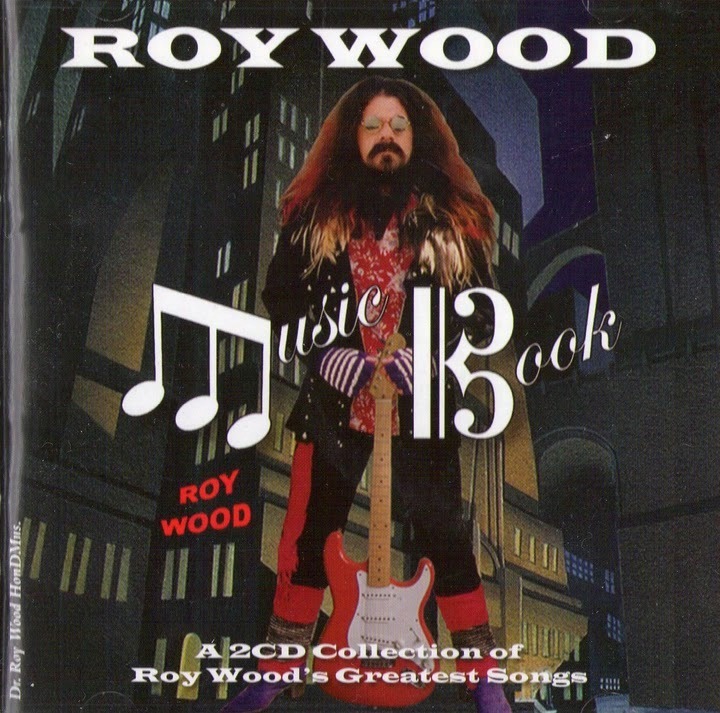 The 36 track 2CD Roy Wood musical biography "Music Book" just released by EMI/Harvest [#50999 73122128] on Monday 14th November covers all the bases that you would expect in a two disc set - and more! Yes, you will find the Roy Wood and Wizzard back catalogue standards on here including "Angel Fingers", "See My Baby Jive", "Ball Park Incident" and "Forever" et al. But there is so much of his other work crammed on here that the whole set comes over as a refreshing set of songs that do justice to Roy's near five  decade of multi-instrumentalism and song creation. The classic Rock 'n' Roll back beat influence is there as is that of the Phil Spector 'Wall Of Sound'. 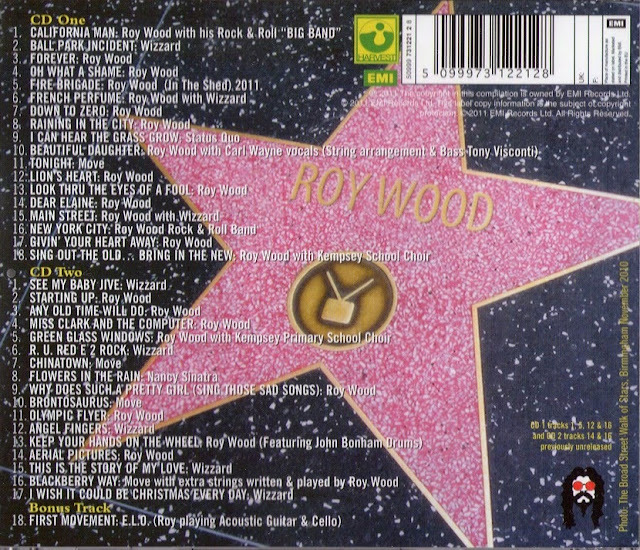 The album commences with a live recording of Roy with his Rock 'n' Roll Band playing their live brassed-up version of "California Man" but with an initial "Brontosaurus" flavour which heralds this superb 'Greatest Hits and more' collection. Included in this set are two covers of The Move classics: "I Can Hear The Grass Grow" and "Flowers In The Rain" by none other than Roy's touring buddies Status Quo and [believe it or not] Nancy Sinatra! It's also interesting that the class Move track "Beautiful Daughter" is listed on this CD as being by 'Roy Wood with Carl Wayne vocals [String arrangement and Bass: Tony Visconti]'. I wonder whether this is a token of the rift that appears to exist between Roy and that of his former band mates Bev Bevan and Trevor Burton as they continue perform and tour as The Move? On the other hand there is much evidence of Dr. Wood's sense of humour with "Are You Ready To Rock" listed as "R U RED E 2 ROCK". A 2011 'Shed' version of "Fire Brigade" is here as well as his superb contribution from the debut ELO album: "First Movement" sub-listed as 'Roy playing Acoustic Guitar and Cello' - a real bonus track if ever there was one. Also included is a fantastic twenty  page CD booklet that includes Roy with his collaborators through the years including Jeff Lynne, Jimi Hendrix, Paul McCartney, George Martin and daughter Holly amongst not a few others. What I really like about this album is this: I've been reacquainted also with Roy's post-Wizzard material. Songs long ignored by [so-called] 'major' record labels to their absolute shame. I was thrilled to listen to "Oh What A Shame" and "Any Old Time Will Do" again on this album from his "Mustard" period on Jet Records. ELO Beatles Forever [ELOBF] recommends "Music Book" by Roy Wood to those enlightened folks who enjoy the music of ELO, Jeff Lynne, Roy Wood, The Move, Wizzard, The Idle Race, 'Brum Beat', The Beatles and related artistes. Great as the music is to a long-time fan, it was very disappointing to several of us that an opportunity was missed to include the two Jeff Lynne collaborations from 1989, 'Me And You' and 'If You Can't Get What You Want', plus so many of the songs Roy had been performing with the band like 'Kiss Me Goodnight Boadicea', 'Electric Age', 'Big Girl Blues', 'Spektacular', 'House Of Love' and so on, in place of numbers which are already available on the recent EMI CDs. Surprisingly enough, in only 3 years, it has completely sold out, everywhere. No way of getting.